Global environment demands universities and colleges to be centres of innovation. Faculty have to balance the expectations of good teaching as well as creation of knowledge through active research. Additionally, our early education system hardly offers enquiry-based learning, limiting the ability of graduates to serve the needs of technology industry and academia. The onus for filling this gap in education falls on the overburdened Indian faculty. 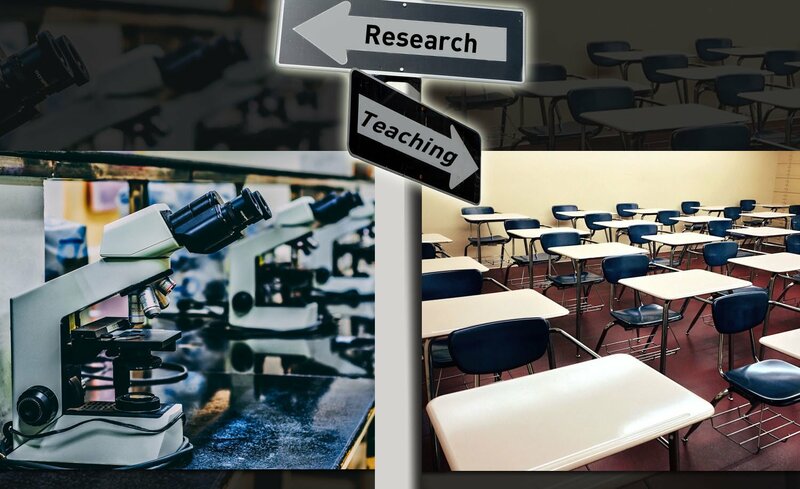 In such a scenario, how does conducting active research fare against classroom teaching? Several studies have explored the relationship between a teacher’s research activity and teaching performance. A study conducted at the International University of Catalonia Spain explored this relationship using a large dataset of students enrolled in 229 courses (spread across the disciplines of architecture, health and social sciences). The authors explored the relationship to be - positive (mutually reinforcing), negative (conflicting) or neutral (no effect). One of the major conclusions of the study was that for a teacher conducting active research, teaching commitments could be challenging. We here explore this relationship in the Indian context through discussions with senior educators. For improving the pedagogy of teachers through active research we need to assess if quality research is indeed practised. Unfortunately, a large proportion of faculty in our universities and colleges suffer from the lack of adequate infrastructure. Addressing this, Lakhotia says “An educator could discover knowledge through reading, discussions and discourses. This is the simplest way for an educator not involved in active research to deliver up-to-date knowledge.” Bimal Nath adds “When students gain knowledge by questioning ‘how’ ‘when’ and ‘why’- then the pedagogy becomes meaningful. In case of a dearth of resources, an ideal teacher can motivate students to think”. Such inspiring stories of teachers’ efforts can be found here. Other thinkers of the field - like Parker and Serow consider teaching and research to be conflicting engagements. They attribute the conflict to the evaluation process for faculty promotion and appraisal that clearly favour research activities over teaching. Young academicians who need to carve out a career might not be motivated to invest time in teaching. Senior academicians attribute this outcome to ‘university rankings’ that are biased towards innovative research. It is important here to delineate the goal of universities and colleges. Universities are more focussed on research, while colleges thrust on the learning process. MHRD has relaxed the criteria of API (Annual Performance Index) allowing college teachers to focus on teaching – hitting two birds with one stone – the move might also curb the rise of predatory journals. The evaluation of college teachers will be based on teaching performance, whereas, university teachers would be graded on research output. Research shall no longer be mandatory for the promotion of college teachers. Interestingly, grades can be also earned via other meaningful engagements like social work, adoption of a village, aiding students in extra-curricular activities and uploading subject course on Swayam. Lakhotia suggests another criteria for assessment - “Every teacher should be assessed by students.” Taking students’ feedback for every class is, in principle, necessarily required (as per the UGC and NAAC guidelines). To this Lakhotia says “ This rarely happens and thus teaching is not objectively rewarded.” Student feedback taken anonymously can be shared with teachers for self-review. This can also be used as a metric for promotion, much like the modern school management practices followed around the globe. The third scenario indicates that teaching and the knowledge production process are independent tasks – and require separate sets of preparation and personality traits. Lakhotia does not concur – “Teaching and research are mutually reinforcing. I learned from my students; our discussions provided a previously unthought of direction to my research. Moreover, a researcher’s questioning mind is an inspiration for students.” He suggests that emphasis should be placed on aligning the curriculum with the research interests of lecturers. India is home to one of the world’s largest education systems – considering the number of institutes for higher education and the number of students. With the long overdue education policy being drafted, steps towards improving the higher education should include teacher skill development. A well-informed teacher can create a well-equipped student, ready to face the real world.